What is my AlertPay Callback URL? When using Alert Pay as your online payment method, it is necessary to provide a "Callback/Alert URL" in your AlertPay settings which directs the shopper back to your store. This is required in order for the order to be completed successfully. To set the callback URL, login to your AlertPay account. Go to "Business Tools," then select "IPN Setup" under the "IPN" section. To access this area, Alertpay requires your "Transaction PIN." Enter your Transaction PIN and click on "Access"
Click on the "Edit" icon for the respective business profile. 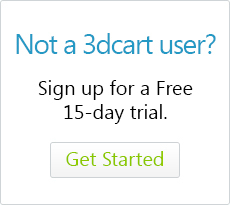 For IPN Status, select "Enabled"
For Alert URL, enter the URL: "https://YOURDOMAIN.3dcartstores.com/paymentreceive.asp?gw=alertpay"
Click the "Update" button to complete. Your Alert Pay account should now be properly configured.